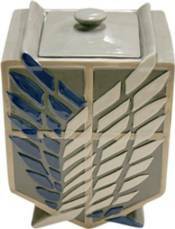 Attack on Titan Scouting Corps Cookie Jar:Keep your sweets in this distinctive Attack on Titan Scouting Corps Cookie Jar that looks like the Scouting Corps emblem. Hand wash only. Not dishwasher safe. Do not microwave. Ages 13 and over.